So-called River Warriors—a group tasked with overseeing the cleanup—spruce up Estero de Paco. Photo credit: ADB. The clogged and heavily polluted Estero de Paco received a much-needed cleanup in 2009. It was the first Pasig River tributary to be rehabilitated. The Pasig River Rehabilitation Commission cleared and stabilized the riverbanks, removed garbage, dredged the channel, and installed floating aerators. However, the canal still reeked and remained unable to sustain aquatic life. Clearly, more interventions were needed. The Asian Development Bank’s (ADB) Pilot Project to Improve Environmental Conditions of Estero de Paco in the Philippines aimed to raise water quality by capturing pollutants before they reached the estuary. The project, which began in August 2012 and closed in January 2015, was cofinanced by the Spanish Cooperation Fund for Technical Assistance and the Water Financing Partnership Facility. With a $440,000 grant, it brought together the private sector, government agencies, media, and community in various activities that cleaned up the putrid waters of Estero de Paco. Estero de Paco brought disease and death to communities living along its banks. Bad waste management practices and insufficient and inefficient infrastructure made it a breeding ground for germs that cause diarrhea, dengue, and other diseases that kill millions of people every year. Like the Ganges in India and the Yangtze in the People’s Republic of China, the Pasig River in the Philippines was the conduit of commerce and trade, until it succumbed to urban pollution. Its tributaries served as sewerage for domestic and industrial wastes from factories and slums that sprouted on its riverbanks. According to the United Nations, more than 80% of wastewater resulting from human activities is discharged into rivers or the sea. Every day, some 1,000 children die of preventable water and sanitation-related diarrhea diseases. In the Philippines, diarrhea is the third leading cause of child illnesses and the fourth leading cause of death among children less than 5 years old. Surrounding communities, the nearby Paco Market, and several business establishments used the 3-kilometer Estero de Paco as an open sewer. They had nowhere else to throw their trash. Garbage collection was not regular because the garbage trucks could not navigate through the community’s narrow alleys. The collectors found it too tedious to carry all the household garbage to their trucks. Only a few of them did it, and only occasionally. Residents opted for the easy way out and threw their garbage into the river. Waste from the nearby Paco Market was not regularly collected either. Vendors simply dumped their trash into the river, including waste from the fish section. Neither vendors nor residents want to pay for garbage collection. They did not want to segregate or compost their waste, which was 90% biodegradable. They also did not want to pay for sewage connection. Obviously, the problem was not merely lack of infrastructure. People’s behavior was killing the river. Ramshackle houses line the banks of the Pasig River in Manila. Photo credit: ADB. The high intensity of participation by residents and communities has been the defining characteristic of this pilot project and the key to the project’s immediate success and long-term sustainability. The project funded the communication activities that helped mobilize the community to action. It assisted ABS-CBN Lingkod Kapamilya Foundation, Inc. and Maynilad Water Services, Inc.in using various approaches to raise awareness on wastewater disposal and management, solid waste management, and desludging septic tanks as well as on the overall the state of the Pasig River and Estero de Paco. One of the most crucial activities that energized and sustained the whole communication campaign was the training and mobilization of “River Warriors,” a group of residents who volunteered to clean up the river and actively campaigned to promote behavior change. The warriors went from house to house raising people’s awareness on the importance of waste management and the use of proper sanitation facilities. River warriors used the project-funded storybooks and magazines for storytelling sessions with children and women, respectively, to convey the importance of waste segregation. The project also mounted a street play that further emphasized the need for proper waste management. Ang Halimaw sa Tubig (The Monster in the River) taught people about the environmental and social effects of throwing trash in the river. This was complemented by mural painting activities that further emphasized the need to change the community’s environmentally harmful practices. Reforms were also made in the way waste was managed in the community. First, collection, transfer, and storage schedules and points were set up in selected alleys. The routes and schedules of the local government’s garbage trucks were then adjusted to sync with the new collection, transfer, and storage schedules. ADB provided the containers that were placed at the waste storage points. To encourage residents to recycle, the project established materials recovery facilities right at the community and Paco Market. Waste segregation was also encouraged. It was used as an income-generating scheme that helped pay for the wages of the garbage collectors. The project built a low-cost condominial sewage system in Barangay 672—a village with 58 households and 496 individuals that were served by only seven substandard septic tanks. The new sewage system collects household water through a network of PVC pipes and manholes connected to a sump pit, which temporarily stores the wastewater. Solar-powered submersible pumps then convey the wastewater into an anaerobic baffled reactor—an anaerobic digester capable of treating wastewater. Maynilad, which is a water and sewage concessionaire, removes system solid wastes and sludge monthly. From the anaerobic baffled reactor, the wastewater falls into an artificial wetland planted with vegetation that further treats the wastewater before it is released into the Estero de Paco. The wetlands can process 30 cubic meter of wastewater per day. Much has changed at Estero de Paco. From being a bed of trash, the river was brought back to life. Gone was the litter that gutted the life out of the river; in its place are pocket gardens and flowing waters that no longer reeked. If replicated, the project can clean and revive all the other tributaries that lead to the Pasig River. The revival of Estero de Paco mirrors the revival of the communities that line the waterway. The project has empowered the people and mobilized many of them to become River Warriors. The project has helped the community draw up an initial solid waste management plan, which helped both residents and vendors along the river to segregate and recycle waste and unclog the waterway. Garbage collection was significantly improved, with collection bins placed in strategic areas within the community. Organic waste collection and vermicomposting were also established in the community. Proper waste management practices support the infrastructure built in the river that intercepts pollutants before they can even reach the river. The project helped build a wastewater management system composed of a condominial sewerage system, solar-powered sump pit, anaerobic baffled reactor, and a wetland. The project has brought stakeholders together to clean up the river and empowered the community to take charge of maintaining the river’s rehabilitation. The project was turned over to local organizations—Kilusang Pang-Kapitbahay at Pangkabuhayan, Inc. and representatives of Barangay 672—through a memorandum of understanding that specifies the roles and responsibilities of key stakeholders in improving the environmental conditions of Estero de Paco. One of the key lessons of the project is the importance of sustained awareness-raising and capacity-building activities to reinforce positive change. The infrastructure built within the community would have been wasted if people did not know how to use it and if they continued dumping waste in the river. Communication and social mobilization toward behavioral change were key ingredients of the project. The use of different media to convey the urgent message of cleaning up the river was effective in raising the visibility of the project not just within the community but also to a bigger public audience. This helped bring together various stakeholders, including private sector partners. Media mileage was an incentive for the private sector. It was an encouragement and a pat on the back for the community. Community mobilization complemented the technical components of the project. Combined with a simplified low-cost sewerage system and a solid waste management system suitable for unplanned low-income areas, community participation transformed Estero de Paco from an ailing river to a healthy body of water, able to sustain life and community. The successful cleanup of Estero de Paco will have a much wider impact if the project is replicated in other communities lining the many tributaries that flow into the Pasig River. Reviving Estero de Paco is not enough, but it is a good start. Asian Development Bank (ADB). 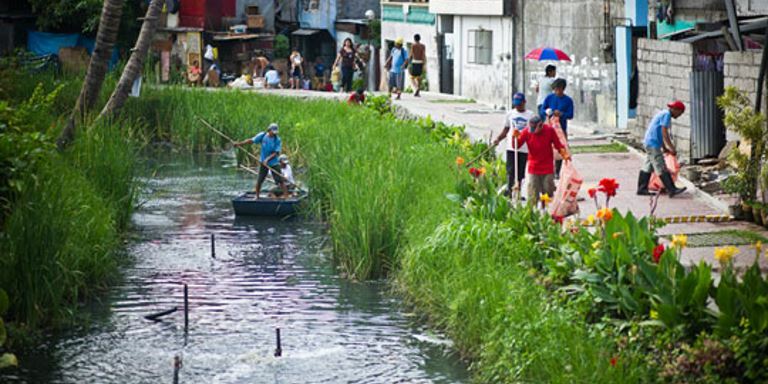 Philippines: Design of a Pilot Project to Improve Environmental Conditions of Estero de Paco. ADB. 2016. The Communication Story of Estero de Paco. Available at the ADB Knowledge Event Repository. ADB. 2015. Technical Assistance Completion Report: Design of a Pilot Project to Improve Environmental Conditions of Estero de Paco. Manila. F. Tanggol. 2016. Kapit Bisig Para sa Ilog Pasig: Communication Approaches and Lessons. Available at the ADB Knowledge Event Repository. J.C. Brotons. 2016. The Communication Story of Estero de Paco. Slideshow presentation available at the ADB Knowledge Event Repository. UNICEF. Diarrhea among the Causes of Absence in School. Javier Coloma Brotons is an urban development specialist at Asian Development Bank. He spearheaded the Pilot Project to Improve Environmental Conditions of Estero de Paco.